WindBreaker is a hybrid probiotic/enzyme blend formulated with Bacillus subtilus and the enzyme alpha-galactosidase. The synergistic action of these ingredients deliver several benefits; among them are better digestion and nutrient absorption, with less gas and bloating. Bacillus subtilus is among the predominant probiotics inhabiting the multichambered stomachs of grazing animals; it breaks down stubborn grains and grasses. It’s also common in healthy human microflora, and has been shown to reduce common symptoms of gas and bloating that contribute to irritable bowel syndrome (IBS). The enzyme alpha-galactosidase is produced within both the salivary glands and the pancreas; unfortunately, its production declines with aging. Our formula delivers therapeutic amounts of this enzyme, to improve digestion and reduce the amount of undigested carbohydrates which can ferment within the large intestine to cause bloating and flatulence. 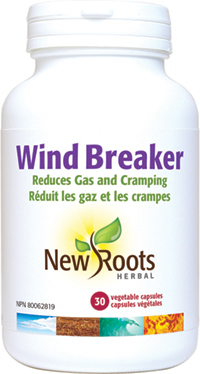 Choose WindBreaker for the digestion of a broad range of healthy, fibre-rich foods, free from socially awkward bloating and flatulence. Adults ≥ 18 years: Take 2–3 capsules three times daily. Take with first bite of a meal. Consult a health-care practitioner for prolonged use. Other ingredients: Microcrystalline cellulose, cellulose, vegetable magnesium stearate, and silicon dioxide in a non‑GMO vegetable capsule composed of vegetable carbohydrate gum and purified water.